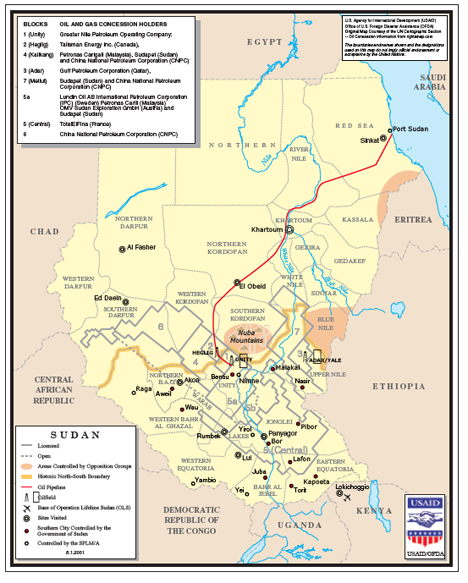 On 9 July 2011, South Sudan is due to be born as a new African country. The Sudanese recently voted in a UN referendum to separate into two different countries. Sudan has been troubled with civil war particularly in the South Darfur region in a struggle between different ethnic groups to control the country's energy resources and some have even gone so far as to claim that this may have been the world's first 'Climate Change war'. For many there is relief and hope that a division of the country may finally bring peace. But what will this split mean geographically and trade-wise for the newly created South Sudan. For a start the new country will become landlocked losing its access to the Red Sea and more importantly its direct access to Port Sudan. Over the last decade, Port Sudan has received considerable Chinese investment. Its port operations have been beefed up and turned into a modern port facility able to process the most up-to-date technology in cargo ships. ﻿The historic capital and trading city of Khartoum built at the meeting of the Blue Nile (source in Ethiopia) with the White Nile (source in Uganda) will no longer be within its borders. In recent years, Khartoum has flourished once again as an important trade centre on the Nile River. Much Chinese investment is going into building infrastructure; a new bridge across the White Nile, a sparkling new airport and much new office space and hotels. Much of the recent boom in Khartoum is due to the building of an oil pipeline to transport oil from the southern oil fields to Port Sudan that passes through Khartoum. When the export pipeline came online in 1998, oil exports increased greatly from a meagre 20-30 barrels a day to upward of 350 barrels a day from 2004 onwards. The new administrative capital for South Sudan will be Juba, a city too located on the Nile (the White Nile), north of Uganda, but lacking the strategic resonance of Khartoum. Oil is the major revenue generator for Sudan, in 2009 it brought in more than 90% of foreign earnings. Around 75% of the oil reserve will be located in South Sudan. But the oil pipe that transports the oil to the Port Sudan will be controlled by the North as shown in the map above. This does not bode well for South Sudan as has often been demonstrated in other parts of the world, those who control the pipeline often benefit from a position of power. Moreover the Southern Sudan provinces and the North already have a history of squabbling over the price of oil and their respective shares of profits under the 2005 Comprehensive Peace Agreement. China's economic and human presence in Africa has continued to rise over the last decade. In fact, China is the biggest and most active player in Sudan. It has a 40% interest in the oil fields. It has also recently announced that it has entered into a $1.2 billion contract to build a new airport in Khartoum capable of handling aircraft as large as the Airbus A380 that will open in 2012. In recent years, the number of Chinese expatriates working for Chinese companies on big infrastructure projects in Sudan has increased. Small merchants, traders, and others too have joined the large company workers in Sudan, attracted by business opportunities for independent entrepreneurs. They have established Chinese restaurants and other amenities for the workers of the large companies. They have become an anchor for the large Chinese community in Sudan. One of the first big tasks for the new South Sudan Government will be to agree with the Khartoum-based Government, a new set of administrative conditions for ongoing oil export. The existing arrangement between the North and the South will expire in July 2011. However, with the loss of direct access to Port Sudan within its borders, South Sudan is said to be already exploring alternative options with neighbouring countries Kenya and Uganda to export its energy resources. These include a proposal for a new oil pipeline to Kenya (although this is not thought to be viable as it would need to go uphill and would be very costly) and a possible rail link going through Uganda and on to Kenya. China has expressed reservations about the cost-effectiveness of the proposed routes. But there is speculation that Russia may be interested in investing in the largely untapped gas resources that the country holds. Experts agree that there is also considerable scope to increase oil production in South Sudan. The next few months will be busy as final arrangements are completed for the arrival of Africa's newest country. The Geo Trade Blog will continue to follow events in Khartoum and in South Sudan.